THE myth that castles only exist in fairytales and other faraway places have been debunked as they are also found right here in Kuala Lumpur. Complete with turrets and battlements for walls, the only thing missing in these structures are a moat and drawbridge unless you count a drain as one. These structures were built in serene locations surrounded by Mother Nature in prominent neighbourhoods around the city. Dreamy: Blue conical roofs and turrets make Sophia’s Place in Ampang Hilir stand out, even more so at night when its lit up facade is reflected in the lake’s water. One such magnificent structure is a dreamy blue-roofed one named Sophia’s Place with turrets, one of them with rows of windows as high as the tower walls with an expansive view of a lake. Sporting the typical conical-shaped roof of castles, this structure located in Ampang Hilir is lit up at night and its reflection in the waters enhances its mythical quality. 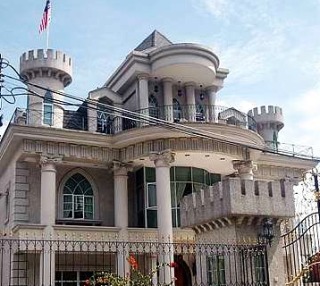 Damansara Heights also has its own castle built of grey stone with white trim complete with a Malaysian flag flying upon one of its turrets. This majestic home boasts of a grand front with an imposing gate flanked by two high tower-like structures. Another massive castle-like structure in the making is in Bukit Tunku. Going under the hammer: Owning “Camelot” and living the fairytale castle life can be a dream no longer as it will be on auction tomorrow. This three-storey eye-grabbing structure comes with a one-storey attic and upon completion will also have a swimming pool. The history of castles dates back to the early centuries in Europe where they are still found to this day, including the famous ones like Leeds Castle in England and the Castle of the Teutonic Order in Poland. Originally built to protect strategic locations from enemies or as military bases, the earliest castles were made of timber and earth and later on stone and brick. Castles were usually where the local nobility lived and were political centres though into the Renaissance period, its role widened into manor homes and now as commercial residences for visitors to stay. 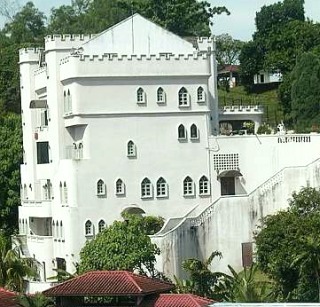 Lovely: Straight out of a fairytale into reality, this castle was found in Damansara Heights and even had the Jalur Gemilang flying in the wind on the tower to its left. 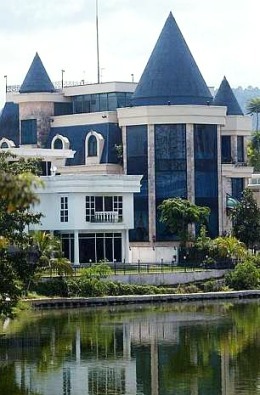 Those who fancy living the dream can now own their own castle as a white one also located in Bukit Tunku which will be put on public auction tomorrow. Nicknamed Camelot, the name of King Arthur’s castle, the six-storey home sits on 1,486 sq metres of land and comes with a swimming pool. The home will be sold on a “as is where is basis” with a reserve price of RM6mil at the Auction Room, Execution Division, High Court Kuala Lumpur at 10am.